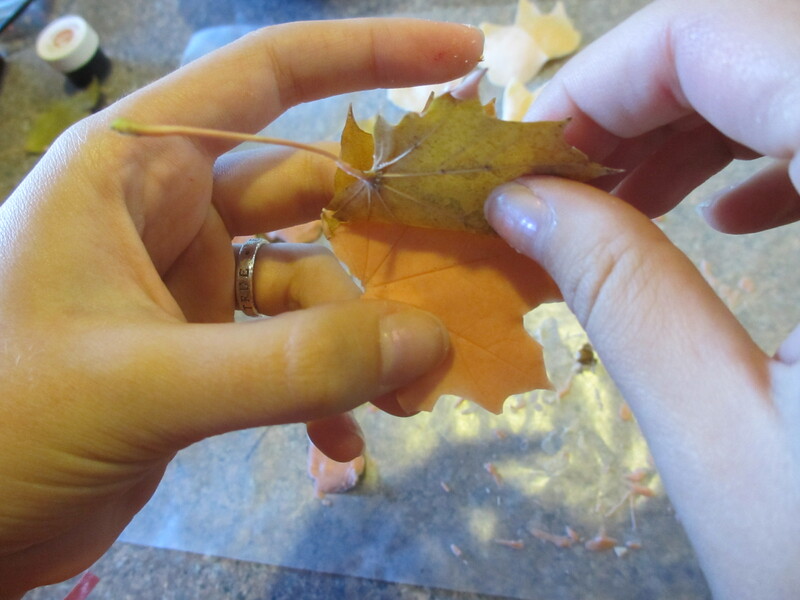 Fun, Edible, Easy, Spectacular Thanksgiving Project | Homeschool Supermom…NOT! First you need to go outside and collect some leaves. This is the educational part – a nature walk! The leaves don’t have to be pretty colors. They can be plain or ugly. But they do need to be supple, not dry and crumbly; smooth, not fuzzy, and on the small side – no larger than 2 or 3 inches long. No poison ivy! That would be a disaster! Wash them (like you would wash lettuce), lay them flat on a towel, cover with a second towel to blot water. 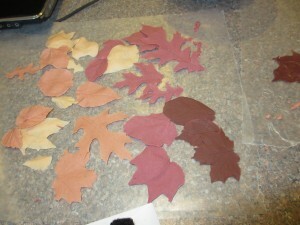 Then let them air dry completely. Have you ever seen chocolate with powdery white streaks in it? That’s what moisture does to chocolate, so it’s important your leaves are completely dry. In a small bowl melt a handful of chocolate coating caps – about a half cup. I do it in the microwave. Chocolate is very delicate and burns quicker than you can blink. Most candy makers recommend not melting chocolate in the microwave (they recommend a double boiler) because chocolate burns so easily. However, I melt the chocolate in the microwave using this method: heat your coating caps for one minute in a glass bowl at 30 percent power. Stir well (you won’t see a noticeable difference at this point). Put it in the microwave again for a minute at 30% power. Stir again. Continue to do this until melted. If it’s close to being melted, but has a few lumps left, don’t put it back in the microwave, because it will burn. Just stir well to melt the remaining lumps. If you notice your chocolate going past the melt stage and getting hard and crumbly, it means you’re burning it. You can add about a tablespoon of shortening – stir until melted – to smooth it out again. 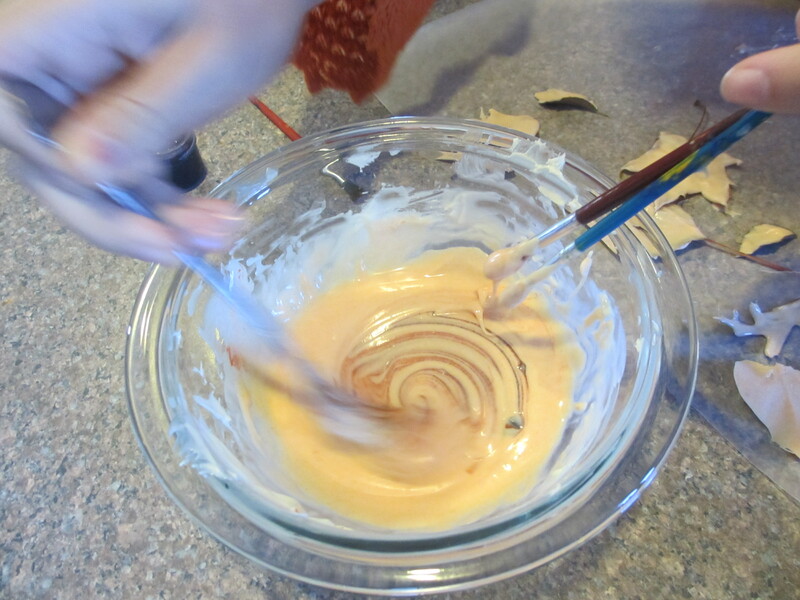 At this point you can stir in some food coloring. 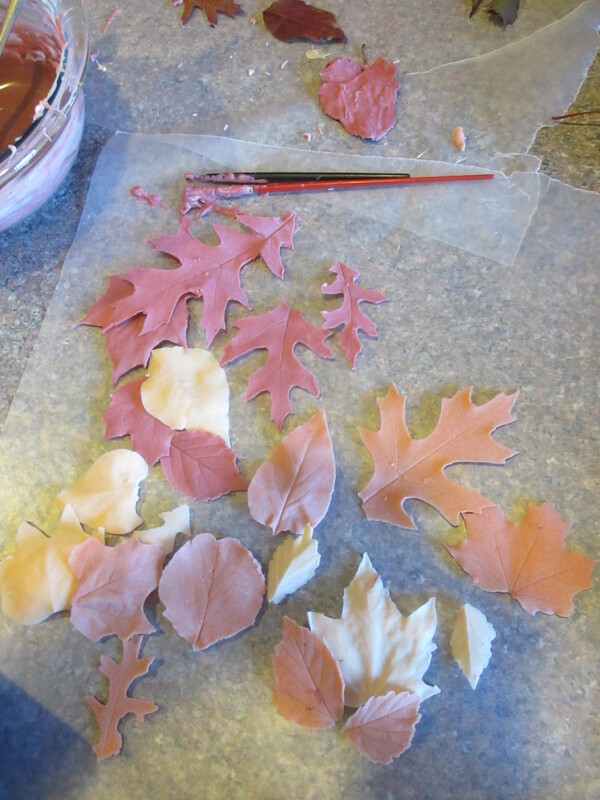 Paste colors (such as Wilton) work well. Liquid food colorings don’t work well because you’re adding moisture to your chocolate – and you already know what that does to chocolate. Line your counter with wax paper. Turn the leaves bottom side up (with the veiny side showing). Paint them with a paint brush. 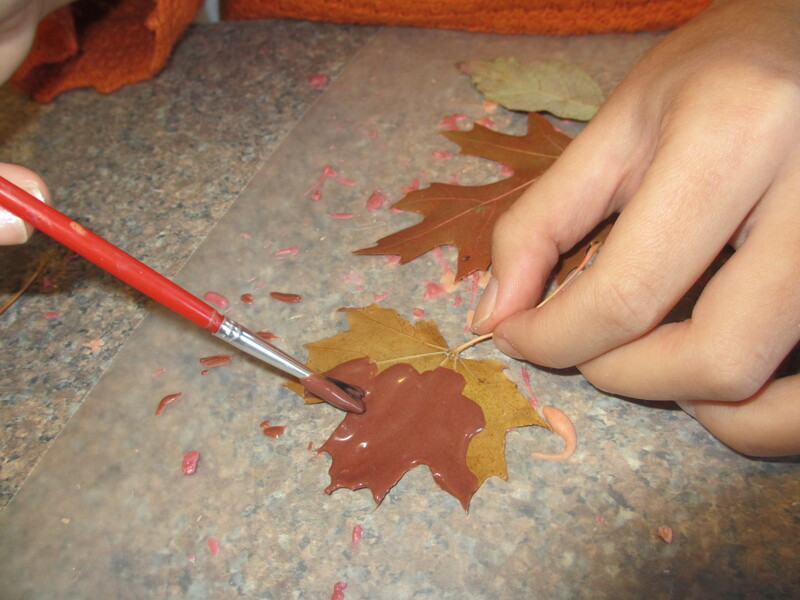 You should use a coating thick enough that the leaf doesn’t show through. If it’s too thin, you won’t be able to handle it without breaking it. Set the wet painted leaves on the wax paper to harden (you can speed this process by placing them in the refrigerator). It only takes about 10-15 minutes on the counter for the chocolate to harden. Once hardened, carefully peel the leaves off and discard. 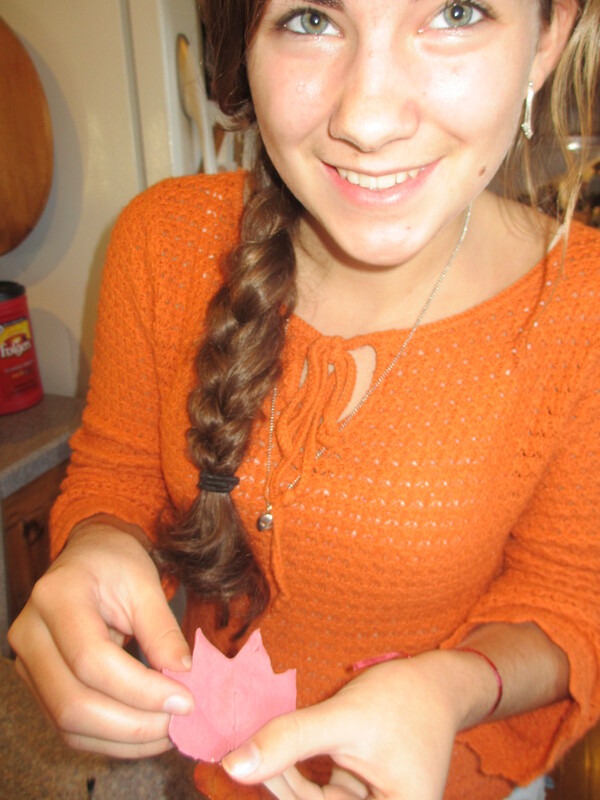 You have lovely edible chocolate leaves. 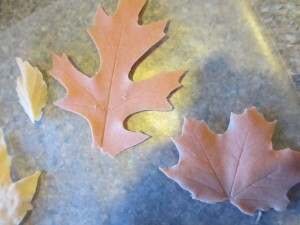 Use them to decorate a cake or parfait…or just set them on a plate as part of a center piece. Enjoy! This entry was posted in Holidays, Projects, Recipes and tagged fun projects, holidays, recipe by Susie Kemmerer. Bookmark the permalink.